Bringing the outside into your home has never been easier with bi-folding doors. These innovative glazed doors have panels that fold into each other and stack to one side. They won’t take up your space on either side. These doors are incredibly versatile; choose from two – six panels depending on how big you want your door. They can open inwards or outwards to let you make the most of your space and unlike traditional sliding patio doors can open fully. Have the whole door open to make the most of out your home or just one panel to let air flow around your home. Enjoy the sunshine even when it’s raining with bi-folding doors. With slim frames and wide glass panes, the maximum amount of light comes in, so your home becomes bright and welcoming. For rooms that before only had small patio doors, bi-folds will make a world of difference. They’re able to take up the whole back of your home so you can create a fully glazed wall. This will give your home an impressive modern look as well as fill it with light. This means that whatever the weather does, you can admire your gorgeous views in the comfort of your home. Add some outdoor living to your home with the help of bi-folding doors. When fully open, your garden becomes an extension of your home. Parties will always be a success as your home and garden become open-plan and guests can move around easily. This lets you fit more people in and if the weather changes, you can easily move inside. During the summer, enjoy alfresco dining every day. Add outdoor furniture to your garden such as outdoor sofas and even ovens so you can make the most of your space. Even when it’s colder you can enjoy being outside Think comfy blankets, a mug of hot chocolate and star gazing or watching New Year’s fireworks. Our uPVC bi-folding doors offer you the best in style, performance and security. With steel-reinforced frames and secure locks, they are extremely resistant to intrusion. With an easy to use sliding function and available up to 6m wide; it would be the perfect addition to your home. With high levels of thermal insulation, draughts will be a thing of the past and your heating bills should reduce. When it comes to colour, you’re spoilt for choice. From classic white or sophisticated grey to wood effects like Rosewood, you can even choose from hundreds of RAL colours. Get the custom look with your new doors. If you love spending time in your garden, bi-folding doors are ideal. Spend more time creating a beautiful outside space easily. For a full range of home improvements including specialist glazing, conservatories and bi-folding doors in Yorkshire, contact us today. 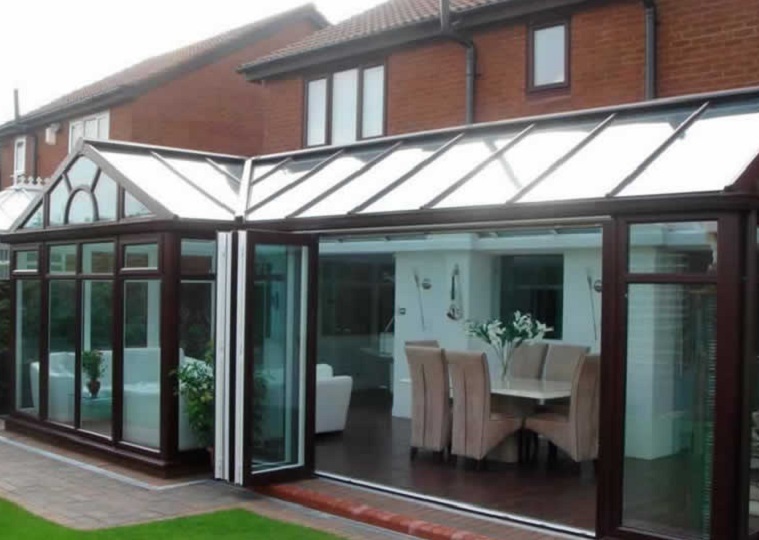 Here at K Glazing, we have everything you need to create the perfect home.